Over 65s are encouraged to sign up for a new course aimed at helping them drive safely for longer. The Drivewise Borders course is being held across the Borders in 2018. The refresher course, which is free and has sessions in the morning and afternoon, aims to give attendees greater confidence when driving. The scheme also allows older drivers to book a 60 to 90 minute practical driving session with an instructor, which is not a test of skills and knowledge but an opportunity to increase confidence and practice any areas that may need updated. There is no need to book a place for any of the above dates - just come along on the day. Why are these courses being run? We have worked with partners including Police Scotland to put on these sessions which we think will prove really beneficial to drivers aged over 65 in the Borders. 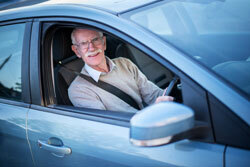 Older drivers have been identified as being at a greater risk than other groups of being injured in road accidents. To continue driving safely, there is a need to recognise that changes can happen, and seek help and advice to be able to drive safely for longer. This is what these Drivewise Borders courses offer. More information is available from the Safer Communities team.